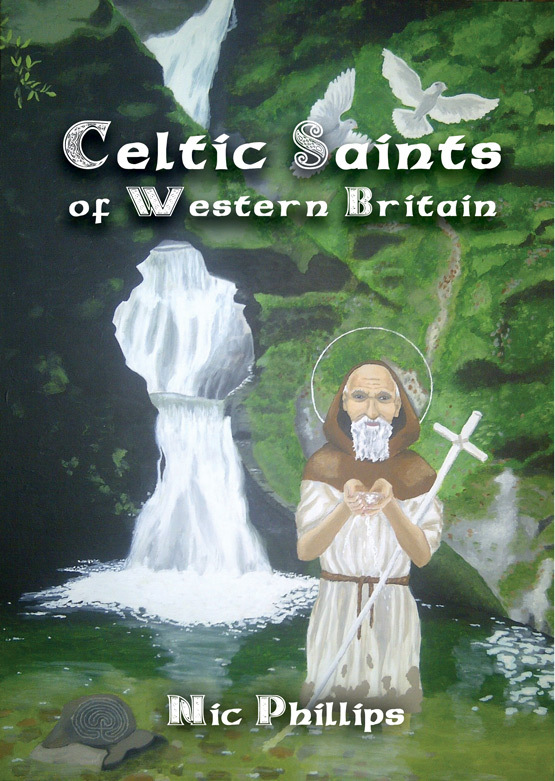 St Piran, one of the 3 saints considered to be Cornwall’s patron, and in the modern day possibly the most popular amongst the Cornish. He was tied to a millstone and thrown over a cliff by the Irish but instead of dying he floated to Cornwall where he set up a church at Perranzabuloe. In the background is St Piran’s cross amongst the sand dunes and in the foreground is the flag of St Piran. This comes from the legend that Piran discovered how to extract tin when a black rock over his fireplace began to ooze white metal. He was credited with the discovery despite tin manufacture having existed for centuries before and was the most popular Cornish saint at the height of the mining industry in Cornwall in the 18th century. The image is partly inspired by the modern pageant where people march to his cross bearing the Cornish flag on St Piran’s day. Acrylic on canvas (20in x 24in).